Cooking Up Dreams is a brand, spankin’ new party that will feature a free flowing, culinary extravaganza with delicious samplings created by 18 leading local chefs and restaurants, a full hosted bar, exquisite wine by Grassini Family Vineyards and Foley Family Wines, dancing to DJ Scott Topper, Dream BIG auction, 805 Party Pix photo booth and more. Proceeds will benefit at-risk youth served by Big Brothers Big Sisters and Family Service Agency. 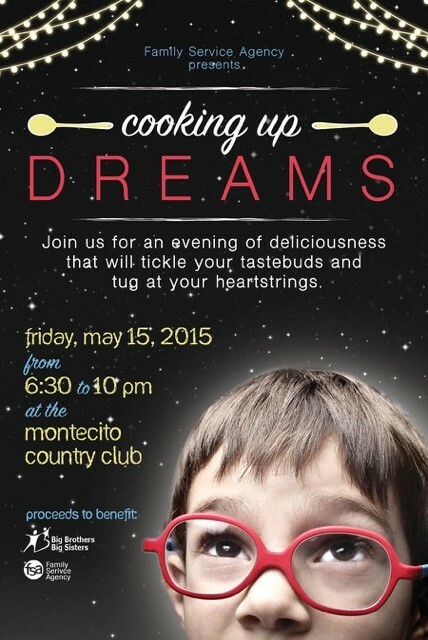 The event will be held Friday, May 15 – 6:30-10pm at the Montecito Country Club. Tickets are just $100! For more information or to purchase tickets, please visit www.cookingupdreams.org. Founded in 1899, Family Service Agency is Santa Barbara County’s oldest non-sectarian, human service non-profit. Strengthening the local community, which is the heart of our mission, is something FSA does through serving families and individuals who are struggling with low incomes, lacking in basic human needs, and experiencing isolation, depression, cultural/language barriers, or violence. The children served are at risk for academic and social failure. 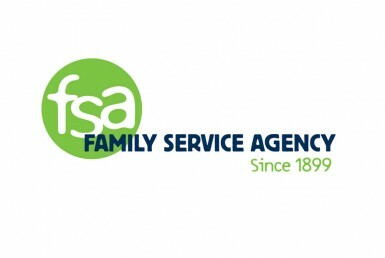 Family Service Agency provides its services for free or on a sliding-fee/donation scale and no one is ever turned away because of an inability to pay. With offices in Carpinteria, Santa Barbara, Lompoc, and Santa Maria, FSA provides services throughout the community. • Big Brothers Big Sisters: Provides at-risk children with one-to-one mentoring relationships. • Senior Services: Provides seniors and their caregivers with the supportive services they need to live independently with quality of life. These services include mental health therapy services, both individually and in group settings, as well as intensive case management services. • Youth and Family Services: Provides affordable family-centered mental health services to all generations within a family and supports academic success through school-based counseling. • Family Support and Information Services: Provides families in need with case management, information and referrals, education, and advocacy so that they can meet basic needs and become self-sufficient. This work is provided through our many Family Resource Centers, located at schools and in the community across the county. – School-Based Counseling works to ensure child/youth success in school and in life by providing counseling on school sites. Executive Chef Ron True is a Santa Barbara native with over 20 years of professional experience. He has worked with some of the most respected chefs and restaurateurs in the country. His career is highlighted by his work at Zuni Café, Gramercy Tavern, Union Square Café, and his own Arlington Tavern. All of his work has led him to have the honor of joining The Boathouse Restaurant last December. Julian Martinez, who has seven years of restaurant experience including serving as the head chef and kitchen manager of Doc’s of the Bay in Emeryville, CA, sous chef at Wexler’s in San Francisco, CA, and server at the French Laundry in Yountville, CA. General Manager /co-owner Jesse Gaddy will run the dining room. Gaddy managed the Shakedown Café in Claremont, CA, is a studying sommelier at Deep Sea Tasting Room, has worked as apprentice butcher at the Old Fashion Country Butcher in Santa Paula, and worked the Chef’s table at Revival Bar and Kitchen in Berkeley, CA. Danny Ibarra, chef at Casa Blanca Restaurant & Cantina, has led the restaurant into its fourth year of supreme cuisine and success. The menu features regional specialties like sope de siete mares and molcojetes, as well as common favorites like tamales, fajitas, and rellenos. Coupled with the Central Coast’s largest tequila selection and their own exclusive Herradura Double Reposado barrel (only available at the restaurant), it isn’t hard to find something for everyone at Casa Blanca. Katie Belanger, owner, chef, and creator of Cinnies, is an honors graduate from the University of Missouri with a bachelor’s degree in Hospitality with an emphasis on Food and Beverage Management and Business. Katie has developed a dedicated passion towards food, working in restaurants for half of her life. Most notably, her culinary skills were honored when she competed on TNT’s On the Menu television series and won the baking episode. Her TV success resulted in having her winning dessert added to all the Planet Hollywood menus recognized around the world. From her prize winnings, she has been able to successfully launch her business, Cinnies, and continue to grow her culinary dreams. Pete has completed apprenticeships with such notable chefs as Albert and Michel Roux, Michelin three starred chefs from La Gavaroche and Waterside Inn of London, Ken Frank of La Toque, Claude Segal, and Francois Pugeot of Orient Express. He has worked in the restaurant and food industry since age seventeen and studied in all facets of the culinary world. By the age of twenty, he completed the advanced placement curriculum at the New England Culinary School. He has run cooking schools and student taught classes with famous chefs such as Jacque Pepin and Wolfgang Puck. Pete’s expertise in menu innovation is world renown, and his depth of creation in the kitchen is truly remarkable. Executive Chef James Siao began his culinary journey growing up in Ohio where he was surrounded by great food in his father’s Chinese restaurant. He was inspired by the way food can bring people together and began to work his way into the restaurant business with local restaurant jobs. Pursuing his dream of being an executive chef, James attended culinary school in Pittsburgh. He later landed multiple positions as the executive chef at various resorts in Arizona along with local family restaurants back in Ohio. In 2009, James jumped on an opportunity to help a friend open a restaurant in Italy, spending the next three months living and working in the country. The time he spent in Italy helped him learn even more about how food and culture intertwine. He returned to the States with a greater appreciation for interacting with the guest and a pproached his clientele mindful of the lessons he drew from living in Italy. He headed to Santa Barbara in 2012 where he now oversees the kitchen at Kimpton’s Canary Hotel’s esteemed restaurant, Finch & Fork. Born and raised outside of Houston, Texas, Executive Chef Jason Paluska recalls being overly enthusiastic about eating as a kid while being inspired by his father’s BBQ dishes. As a young adult, Paluska moved to San Francisco and attended Tante Marie Cooking School for a six-month intensive program. Seen in his talent, Paluska was recruited by Sherry Villanueva, owner of The Lark and The Lucky Penny, to oversee the two kitchens. He has led them into success since Spring 2013. The award-winning Lark and its menu are an extension of both Villanueva’s vision and Paluska’s sensibilities. They are devoted to the concept of a gathering place where people can come to feel a sense of community in an environment that encourages a shared sense of purpose without intimidation. Chef Jean Paul Luvanvi has been a Culinary Chef in Santa Barbara for 20 years. His passion is helping people heal themselves through food and is a true advocate and living example that quality food can increase one’s chances of a happier and healthier lifestyle. Born in France to a French father and Vietnamese mother, Jean Paul’s love for food is in his genes. His knack for combining pleasant, yet unexpected flavors, has caused him to be a highly sought after talent in the culinary field. With a resume that boasts success at well-known Californian favorites such as the Cliff House, the Beverly Hills Health Café, the Fish House, the Shellfish Company, La Barca, Chad’s DISH, and Le Bon Café, Jean Paul now uses his skill and expertise, to focus on his passion: helping and healing people through food. Born and raised in England, Grant “Mac” MacNaughton lived and worked as a banker in London, Singapore and New York before quitting it all to pursue a career in the culinary arts. He studied at the French Culinary Institute before settling in Santa Barbara. He briefly worked at Bouchon before, in 2010, he and his wife opened Mac’s Fish & Chip Shop, an authentic British chippy. An appearance on Food Network’s Diners, Drive-Ins & Dives has ensured that the restaurant has become a must-stop for locals and visitors to the American Riviera. Montecito Village Grocery is happy to have Josefina Ramirez making homemade recipes for our Food Service Department. Many of you might have seen her working tirelessly for over 15 years at Lazy Acres Market in their Food Service Department. Josefina has always had a passion for great tasting food with Natural and Healthy ingredients. For years Josefina has been mastering the craft of blending cultural dishes for everyone to enjoy. Everything we produce in our Deli is made in house with Josefina and her crew. Josefina has created many tasty offerings like Edamame Salad, Kung Pao Tofu, Veggie Quiche, Turkey Pasilla Cakes, Blacken and Herb Salmon, Seafood Cakes, Orecchiette Sundried Tomatoe Pasta Salad, and many more. Nimita prides herself in being able to offer Ayurvedic meals geared to support health, promote healing, and foster community. With Santa Barbara’s abundance and variety of organic vegetables, Nimita is able to conjure up a modified version of Indian Food that focuses on allowing people to respect the flavors of each vegetable while still enjoying the spices. Nimita’s passion to use food to share and bring people together in a nurturing way is illustrated by the way she runs her company, Nimita’s Cuisine, which offers weekly food deliveries to private individuals. In sharing her food philosophy of nourishment, Nimita enriches the lives of others through teaching culinary classes in various venues, offering vending booths in local festivals, traveling the city with her newly added food truck, incorporating lessons in her group therapy practice, and creating a recipe book that is to be released in the near future. In addition, she enjoys being able to provide the core of celebration by catering weddings and private events. This long-time Big Brothers Big Sisters supporter hopes to empower everyone to learn the alchemy of cooking with spices through her involvement in the community. Pane e Vino is a neighborhood trattoria, family owned and operated for 27 years in Montecito. It has always been a favorite for many local residents. At Pane e Vino, you will experience mouthwatering delightful meals prepared with a selection of only the freshest ingredients. The ambiance is like an old fashioned little trattoria in Italy, welcoming and warm! Owner Pietro Bernardo created this restaurant to share his passion for great, simple Italian food with the people who enjoy eating well. Patxi’s (pronounced “Pah-Cheese”) began in the summer of 2004 in Palo Alto, CA, when a pizza lover and avid entrepreneur, Bill Freeman, partnered with an old friend and expert pizza maker, Francisco “Patxi” Azpiroz. Today, nearly a decade and multiple locations later, the pair have turned their passion for fresh deep dish pizza and genuine hospitality into a signature experience that can only be summed up as “Patxi’s.” Much more than just another pizza joint, Patxi’s embodies what your favorite neighborhood restaurant should be—a warm, welcoming place where you can share a delicious meal with friends and family and feel like you’ve belonged all along. Laurence grew up in Northern France surrounded by a family where everyone cooked. It’s no wonder then, that Laurence began cultivating her culinary skills at a prodigal age. She learned how to shell peas, clean lettuce, and peel apples at just three years old. She even took her first baking class in first grade. Fresh, local and seasonal foods became a passion as she showed signs of appreciation for them at a young age. She recalls the pleasure she received from pulling her first carrot out of the garden at age six. Laurence approaches her culinary art with inspiration from French techniques and the multicultural richness of thirty years spent in California. As the cherry on top, Laurence personalizes her creations with a dose of playfulness. For Laurence, each meal offers the opportunity to create and share happiness. Located on Santa Barbara’s pristine waterfront, the Santa Barbara FisHouse offers some of the central coast’s finest fresh seafood. Situated on Cabrillo Blvd across from East Beach and Stearns Wharf, the Santa Barbara FisHouse is a perfect destination for ocean-side dining, offering patio seating by an open fire pit. Local seafood is available seasonally and when marine and weather conditions permit. Seasonal specialties include local Spiny lobster, Dungeness crab, as well as an array of other delicacies. Born and raised in Santa Barbara, Avery Hardin’s love for food blossomed from time spent in the kitchen with his grandmother and parents. Mesmerized by the television programs of Jacques Pepin, Martin Yan, and Julia Child, he grew up continuously inspired by their work. At only fifteen years old, Avery took a job at Deano’s Pizzarama where he fell in love with the craft of food preparation. 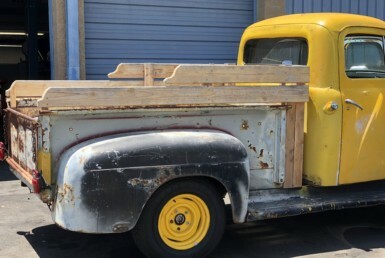 In 2005, he enrolled in the culinary program at Santa Barbara City College leading him into positions at Chad’s, Stateside, Elements, ALC, The Lark, Anchor, and Full of Life Flat Bread until he landed at his current site of practice, Scarlett Begonia. Influenced by the seasons, Avery likes to be creative with his food art, cooking up dishes that reflect the time of year while using locally grown products. Harold Welch is Chef-Owner of World Cuisine Express, Inc., a healthy-food delivery service in Santa Barbara, and a full service catering company. Originally from Barbados, West Indies, Welch has come “through the ranks” in the restaurant industry. 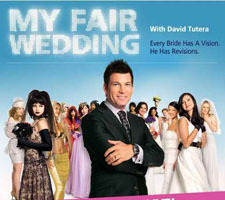 In Santa Barbara, he has worked at the San Ysidro Ranch, Citronelle, and La Cumbre Country Club. Welch always wanted to offer healthy food to fellow diabetics, and in 2005, he created World Cuisine Express for that purpose. Welch creates delicious fine-dining gourmet foods with the freshest local and organic ingredients, offering unique gourmet delights in a fusion of tastes from around the world. Cooking Up Dreams will feature a culinary extravaganza with delicious fare by leading local chefs and restaurants. Guests can dance the night away to music by Scott Topper Productions, relax in one of our lounge areas, or shop at our “Dream Big” auction. A night of play, creative expression and big dreams are in store for all. 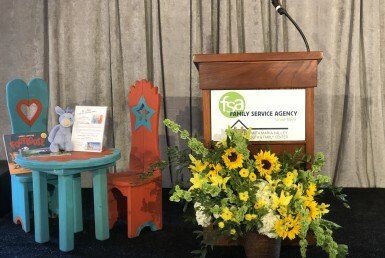 Proceeds from this event will help at-risk kids achieve their dreams through the programs and services of Big Brothers Big Sisters & Family Service Agency.